It was instantly apparent that Marc was passionate about rum and, more specifically, this unique rum from Nicaragua, Flor de Caña (“Flower of the Cane”). He explained that, to date, it remains the World’s most awarded rum in the market and is currently the leading brand in Central America, as well as a growing position in the UK and emerging markets. Flor de Caña is owned by the Pellas family, an Italian family based in Chichigalpa, and the rum is produced solely from their sugar mill in San Antonio, and has been for 122 years. What is remarkable and extremely uncommon is that they own this sugar mill, and do not import from outside – which means that they have complete control over the entire process, and in terms of what this means to the resulting quality… well, the rums speak for themselves! Before I go on to tell you about the different samples, I will just take a moment to talk about the slow-ageing process that takes place. What this means, essentially, is that everything is matured and aged naturally. There is no chemicals or additives – not even caramel – added to adjust colour and there is no blending of ages to alter taste. It is this natural ageing and patience that creates the smooth, silky textures and pure flavours in all of their rums. This is the only 4yr white rum on the market! Crystal clear in appearance, (achieved through filtration with charcoal) it is extremely light-bodied with a delicious exotic taste of coconut and subtle hints of vanilla. Smooth enough to enjoy alone but also a great base for some tasty cocktails. In essence, this is the same as the Extra Dry without the charcoal filtration. In reality, this transpires into a smooth tasting and more vanilla dominating taste, with that coconut profile making a more subtle appearance. Very silky texture. A clear mahogany coloured rum, perfectly balanced and it said to make the “perfect rum and coke”! Defined vanilla and dark chocolate flavours and a wonderfully smooth finish that lingers in your mouth. Moving more into the realms liking to a fine brandy – this would be for those partial to a neat tipple topped with ice or water.. It is reddish-amber in colour and a semi-sweet, chocolate aroma with notes of caramel and nougat. These follow through onto the palate with some wooden characters from the 12 years ageing in barrels. 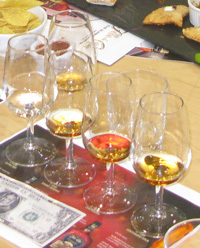 Along with these great rums were some light bites provided by Floridita and Carom @ Meza. These were devine. There were mini lamb samosas… lobster pastries… pork belly… tasty doritos… and finished off with an amazing strawberry sorbet and puree. Just recalling these makes my mouth water. Check out the photo if you don’t believe me! Yumm…. (see below for website information). 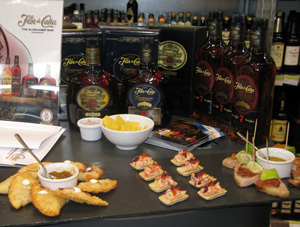 With special thanks to Floridita and Meza for the fabulous food and venue for the afternoon tasting! !